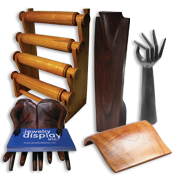 Shop our huge collection of wood displays and showcase your pieces in style! Transform your store's look with handcrafted & unique wooden pieces, available for every type of jewelry: from earrings & necklaces to rings & bracelets and more. Get the best wholesale deals for natural & rustic pieces in many styles & forms, such as hands, busts, trees, spinners & more.